On Launch Pad 39A, workers move the Rotating Service Structure around space shuttle Discovery in order to replace the Tyvek covers protecting the shuttle's nose thrusters in preparations for an Aug. 28, 2009 launch attempt. This story was updated at 5:51 p.m. EDT. NASA fueledthe space shuttle Discovery for a late Friday launch after two consecutivedelays caused by stormy weather and a hydrogen fuel valve glitch. Discoveryis now poisedto blast off at 11:59 p.m. EDT (0359 Aug. 29 GMT) toward the InternationalSpace Station after mission managers settled on a plan to test a suspect fuelvalve aboard the shuttle if it acts up during today?s countdown, NASA officialssaid. It isNASA?s third attempt to launch Discovery following the two delays. Shuttlemanagers skipped an early morning launch opportunity today to give engineersmore time to study the valve glitch. ?Inessence, we?re ready to go,? NASA launch director Pete Nickolenko toldreporters in a Thursday briefing. Discovery has a 60 percent chance of goodlaunch weather at NASA?s Kennedy Space Center in Florida, with thunderstormsand thick clouds posing the only concerns. Lightningnear Discovery?s seaside launch pad threatened to delay the start of fuelingfor tonight?s launch. But the weather cleared in time to start loading theshuttle?s 15-story external tank with the 526,000 gallons of liquid oxygen andliquid hydrogen propellant that will feed Discovery?s main engines duringlaunch. Fueling began 11 minutes late at 2:45 p.m. EDT (1845 GMT). Commandedby veteran astronaut Rick Sturckow, Discovery?s six-man,one-woman crew is set to fly a 13-day mission to deliver a new crewmemberand nearly 8 tons of supplies to the International Space Station. The shuttleis also carrying a new space treadmill named after televisioncomedian Stephen Colbert. NASA isstill not sure why a liquid hydrogen fill-and-drain valve on Discovery faileda prelaunch check during fueling operations Tuesday for a Wednesday launchtry, forcing mission managers to call off the attempt. Thunderstorms preventedan early Tuesday launch attempt. NASA launchrules require the hydrogen fuel valve on Discovery to be closed for launch.Engineers suspect a position sensor that detects when the valve is open orclosed may be faulty, not the valve itself, and have come up with new ways totest it during tonight?s launch attempt, said Mike Moses, head of Discovery?smission management team. ?We are notgoing to truly know that the valve is closed,? Moses said Thursday. ?We aregoing to have a high confidence that it is closed.? Moses andhis team met today at 12 p.m. EDT (1600 GMT) to review the new valve testingmethods and cleared Discovery for its third launch attempt. They were also expectedto review a power unit failure that canceledthe test firing of a five-segment solid rocket engine for NASA?s new Ares Irocket since similar power units are used on the four-segment solid rocketboosters attached to Discovery, Moses said. NASA hasuntil Aug. 30 to launch Discovery before standing down due to a scheduleconflict with another operation on the Air Force?s Eastern Range used forrocket and shuttle launches. IfDiscovery does not launch by then, NASA would have to stand down until Oct. 17to avoid more traffic conflicts at the space station in September, when Japanplans to launch an unmanned cargo ship on its maiden flight to the outpost andRussia is due to launch a new crew and space tourist late in the month. 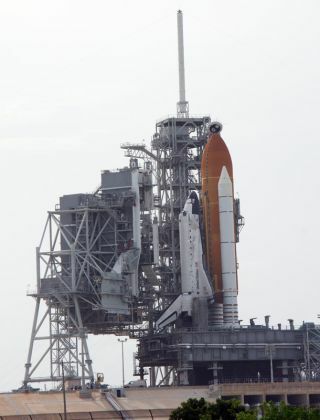 Discovery?sSTS-128 mission will mark NASA?s fourth shuttle flight this year and the secondthe launch at night in 2009. SPACE.comis providing complete coverage of Discovery's STS-128 mission to theInternational Space Station with Managing Editor Tariq Malik in New York. Click here for shuttle missionupdates and a link to NASA TV. Live launch coverage will begin at 6:30 p.m. ET.